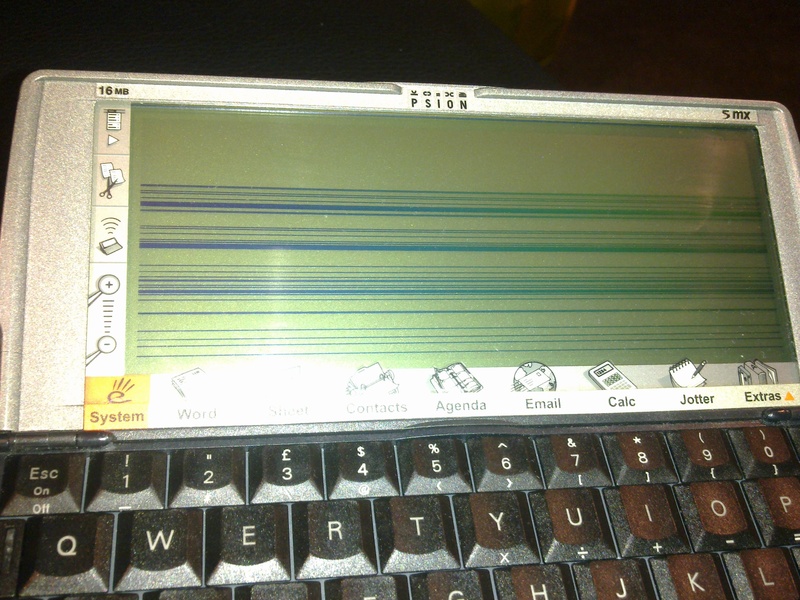 Every so often, my current Psion Series 5mx PDA develops a fault in its screen display. Due to repeated stress on the cable joining the screen to the main body of the device, the connectors in the cable fail. I find that, with my pattern of using the Psion device, this problem arises roughly once every 6-12 months. It’s because I open and shut the device numerous times most waking hours – in order to access the applications on the device which help me to manage my life: Agenda, Contacts, To-do, Alarms, numerous documents and spreadsheets, and so on. The heavy usage magnifies the stress on the cable. I can manage my life with these applications provided the screen is working. When the screen cable fault occurs, I can sometimes mitigate the problem by viewing the screen at a half-open angle. I presume that, with less stress on the cable, the connectors are able to work properly again. However, using the device in a propped partially-open state is hardly an ideal ergonomic experience. Because I know this fault will eventually afflict all the S5mx devices I use, I keep a backup device – bought from EBay. Alas, my current device developed this problem when I opened it last Saturday, as I sat down in the airplane to fly from Heathrow to Barcelona, for this week’s Mobile World Congress event. My backup device is still at home in London. Worse, the usual remediation step did not work in this case: the screen was unviewable even when partially open. Hmm – I thought to myself – maybe this will be a chance to see how well I can function without the device I often think of as my second brain. The answer: it has been hard! Details of my hotel, as well as other logistics matters and appointment details, are stored inside the S5mx. By means of this PC emulator, I was able to find out where I should be at various times, and so on. On the other hand, my laptop is significantly less convenient than the pocket-occupying, instant-on Psion device. Time and again over the last few days, I’ve scribbled notes on pieces of paper, and been slow to identify times in my schedule when I would be able to slot in new meetings. It’s been a strain. Spring-Heeled Jack runs blind, blue fumes crackling from his heels. His right hand, outstretched for balance, clutches a mark’s stolen memories. The victim is sitting on the hard stones of the pavement behind him. Maybe he’s wondering what’s happened; maybe he looks after the fleeing youth. But the tourist crowds block the view effectively, and in any case, he has no hope of catching the mugger. Hit-and-run amnesia is what the polis call it, but to Spring-Heeled Jack it’s just more loot to buy fuel for his Russian army-surplus motorized combat boots. The victim sits on the cobblestones clutching his aching temples. What happened? he wonders. The universe is a brightly colored blur of fast-moving shapes augmented by deafening noises. His ear-mounted cameras are rebooting repeatedly: They panic every eight hundred milliseconds, whenever they realize that they’re alone on his personal area network without the comforting support of a hub to tell them where to send his incoming sensory feed. Two of his mobile phones are bickering moronically, disputing ownership of his grid bandwidth, and his memory … is missing. A tall blond clutching an electric chainsaw sheathed in pink bubble wrap leans over him curiously: “you all right?” she asks. “I –” He shakes his head, which hurts. “Who am I?” His medical monitor is alarmed because his blood pressure has fallen: His pulse is racing, his serum cortisol titer is up, and a host of other biometrics suggest that he’s going into shock. “I think you need an ambulance,” the woman announces. She mutters at her lapel, “Phone, call an ambulance. ” She waves a finger vaguely at him as if to reify a geolink, then wanders off, chain-saw clutched under one arm. Typical southern émigré behavior in the Athens of the North, too embarrassed to get involved. The man shakes his head again, eyes closed, as a flock of girls on powered blades skid around him in elaborate loops. A siren begins to warble, over the bridge to the north. When I reach home again this evening, I’ll copy all my data files to my backup second brain, and (all being well) I’ll be back to my usual level of personal organisation and effectiveness.